(January 07) First, I had 2 cystic acne growing near each other on the right side of my cheek. And as each month passes by, they became a "lump"? Hard tissue on the outside, but softer tissue on the inside based on feel alone. It's not liquidy soft as a regular cyst though. On some days, the "lump" is more swollen, but it's not soft, it still feels hard. There is no pain when I touch it. Has anyone has the same problem? What kind I do to make the lump go down since this is the only problem area I have left? I really don't want to use Accutane. One that's been around that long might benefit from being checked out by a derm. Cortisone likely won't be used as it has no tenderness right now. It may actually need to be excised, particularly if it is large. Otherwise, be prepared for it to hang around for a very long time. Some stay for years. If you want it to go away faster, you will need to employ some exfoliative techniques. You may try manual or chemical exfoliation. Manual would be some type of liquid scrub, or the baby's hair brush method (see signature), etc. Chemical would be an alpha hydroxy acid, a beta hydroxy (salicyclic acid), or a retinoid cream. I would try an alpha hydroxy acid first, a product like Alpha Hydrox Souffle is highly recommended on these boards. It promotes exfoliation and evens out the skin tone very nicely. I use a glycolic acid product and had 85% of my acne cleared with that product alone, just because glycolic is such a wonder. The souffle has glycolic acid. There's no guarantee that exfoliation will help clear such a deep seated cyst. Hmm is there anyone else that have had the same experience or know the solution to my problem? I'm gonna try some Alpha Hydrox Souffle next month and see how that goes, but I would like to know more options if there are any available. No, I have never had any surgery done to that area. Well, I guess it takes time to heal such a thing. No use stressing over it too much. Thank you everyone who tried to help me. 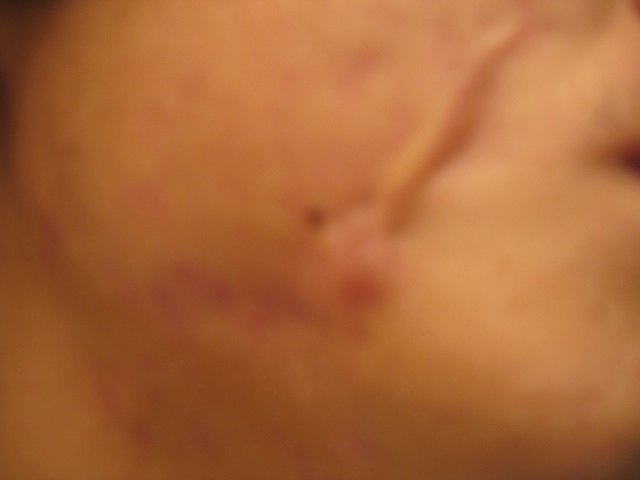 And yes, I've had them after HUGE cysts, the red color disapeard but the lump was there, and had the form of the cyst. I think I'm going to get them removed, that's what the derm told me they were going to do, but I hope it won't leave a big scar... that would be awful. I think I'm going to get them removed, that's what the derm told me they were going to do, but I hope it won't leave a big scar... that would be awful. 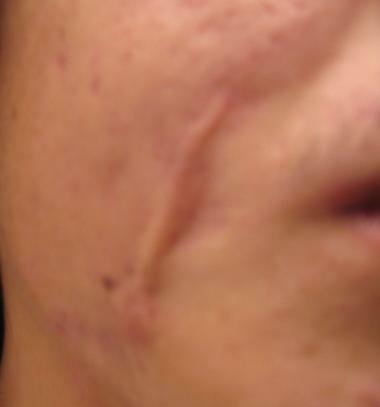 what caused that linear keloid scar? Surely that wasn't acne.